SKU: 7023. 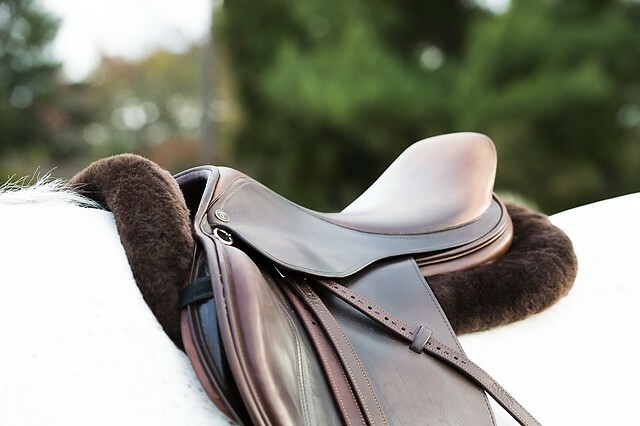 Categories: Shop All ThinLine Products, English Saddle Pads, English Half Pads, Sheepskin Half Saddle Pads, Hunter Jumper Tack, Dressage Equipment, Therapeutic Saddle Fitting Pads, Pony Size Tack. Tags: english half pad, fleece saddle pad, half pad, saddle fitting pad, sheepskin saddle pad. Become a quieter, more balanced rider and improve your horse’s performance with ThinLine English correction sheepskin half pads. No matter what your riding ability is, all riders strive for that extraordinary feeling – being one with your horse. To achieve this, maintaining balance in the saddle is key. No small feat when you’re sitting on a moving animal and trying to coordinate your parts with his parts to make everything harmonious. Meet this challenge with the Full Sheepskin Trifecta Correction Half Saddle Pad. Made of high-quality, quilted cotton, and lined underneath with lush merino wool sheepskin, this half saddle pad has ThinLine sewn onto it. Ride in this pad and you’ll notice immediately how quiet you feel in the saddle. That’s due to the ThinLine doing its job, absorbing the shock of your horse’s movement and transferring it ACROSS the ThinLine pad (instead of UP into your spine.) Meanwhile, your horse’s back is enjoying the same shock absorption benefit. ThinLine has a 95% shock absorption rate, so you can understand why your balance is suddenly more stable, freeing you to give clearer, more precise aids. 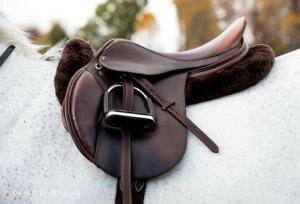 And your horse, with much less jarring on his back, can relax, listen, become supple, soft, and really swing. The Trifecta is also shimmable. So, you can customize saddle fit or resolve fitting problems with less expense. Shims are an especially useful tool if you ride different horses in the same saddle or ride a horse whose body is changing. The Trifecta is our top show correction sheepskin half pad and comes in White, Black, Dark Brown, and Natural. Small available in White and Dark Brown only. Adjust Saddle fit with shock absorbing shims. Order Saddle Fitting shims for your pad: Once you place the pad in your cart you will see a product item: Add saddle fitting shims to the pad in my cart. Voila! If you need shims for a pad not in your cart: Simply click here English Saddle Fitting Shims. Be sure to select your pad’s item number and size when ordering shims. If you find you no longer need shims, simply remove them and keep all the benefits of your Full Sheepskin Trifecta Correction Half Saddle Pad.